Acquiring gorilla permits in Rwanda require planning and booking ahead of time. Visiting with mountain gorillas in Rwanda is a strictly managed operation to protect the critically endangered mountain gorillas in their natural habitat and to maintain their survival. With only 10 habituated gorilla families available for visiting, the number of visitors who can go gorilla trekking on a single gorilla group is limited to 8 people per day, therefore, there is a total number of 80 gorilla permits available a single day. With growing numbers of travelers going see gorillas in Rwanda each year, obtaining a gorilla permit requires to be done early enough to secure your spot. This is especially if you plan to travel during the high seasons / Dry seasons of December to March and June to September, this period being a dry season receives big numbers of visitors and its more favorable to go hiking without too much mud and slippery terrain. The rainy seasons of April – May, and November generally are not as competitive as the dryer seasons. 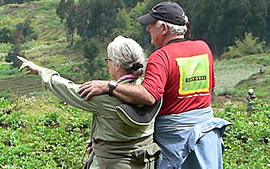 We have offices in both Rwanda and Uganda and have the capacity and ability to purchase gorilla permits for travelers planning their gorilla trekking trip in Rwanda. 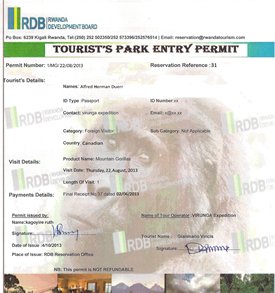 We can also purchase your permit for Bwindi impenetrable forest in Uganda, Mgahinga national park, Virunga national park and Kahuzi Biega national park for the Lowland gorillas in the Congo. Please feel to contact us if you need to book a tour in Rwanda, or book your gorilla permit. Travelers can book directly with the Rwanda Development Board (RDB) – tourism body of the Rwandan government. You can visit their website at http://www.rwandatourism.com/ and can contact them at Email:reservation@rwandatourism.com Phone: +256-705-487-517. A single gorilla permit in Rwanda costs 1500usd paid by all travelers including Rwanda citizens. The Volcanoes national park situated just two hours from the Kigali international airport and Kigali city is home to Rwanda’s mountain gorillas and part of the Virunga conservation region.